The Pittsburgh Penguins may not have made any major moves on trade deadline day, staying relatively quiet after their acquisition of former Senators forward Derick Brassard earlier this weekend and keeping their moves on the day of the deadline limited to some minor-league shuffling. 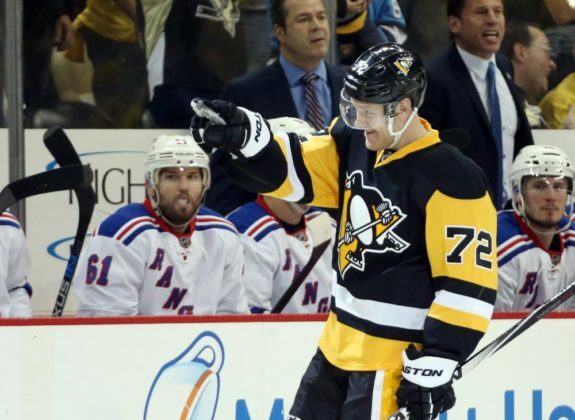 But that didn’t mean they didn’t make any roster moves, as general manager Jim Rutherford announced in a press conference that the Penguins planned to sign Patric Hornqvist, whose $4.25-million average annual value (AAV) contract was set to expire after this season, to an extension. This extension, rumored to be for five years at a $5.3-million AAV, locks Hornqvist in until the 2022-23 season, making him the only player signed that far into the future other than Brian Dumoulin and Sidney Crosby. Hornqvist was by far the most important offseason signing the Penguins would have had to consider. Although they have a lot of expiring contracts this summer—Riley Sheahan, Bryan Rust, Tom Kuhnhackl and Jamie Oleksiak being a few—Hornqvist was the only core player that was headed into unrestricted free agency, where it is likely he would have been able to rack up a price tag of more than just over $5 million per season. Locking in a player for this long of a time period is a rare move for the Penguins. It’s probably a little longer than a team would generally like to promise to a 31-year-old forward, especially one who takes the nightly beating Hornqvist does in front of the net. This contract signals that the Penguins consider him part of their core—he’s the only forward outside of the Penguins’ big three (and Conor Sheary, who’s on a $3 million for three years deal) to be signed through next year. He’s now signed on for longer than any other forward than Crosby himself. The Penguins are right to see him as their core, because in his time with the Penguins, Hornqvist has proven time and time again that he plays a unique game that the team can’t find elsewhere on its roster—and the team’s play suffers without him to prove it. Hornqvist rejoined the Penguins on Feb. 23 after missing eight games with an injury. His loss was felt keenly by the Pens, who despite their 2018 surge. nonetheless saw a significant dip in some of their numbers with him off the roster. Here are a few examples: in the 12 games from Jan. 1 to when Hornqvist was injured, the Penguins’ power play was chugging along at a 33.3-percent success rate, the best in the league. In the next eight games with him gone, it was only working at a 12.5-percent success rate. And it’s fair to label him as a main reason for the Penguins’ power play sagging in February. Hornqvist has an extreme impact on the power play, which sees many, many more shots on goal with him on the ice than it does without him. All of this is because Hornqvist plays a particularly gritty style that no other forward on the roster has been quite able to match when he’s gone. He spends a lot of time in the crease—as displayed by his average shot locations—shoving around goaltenders and opposing defenders as he fights to establish a position in the paint. His presence as a screen raises the Penguins’ shot total as a whole. Their 2018 averages show they make more shots with him on the roster, putting up about 33 per game with him and then only 30 without. 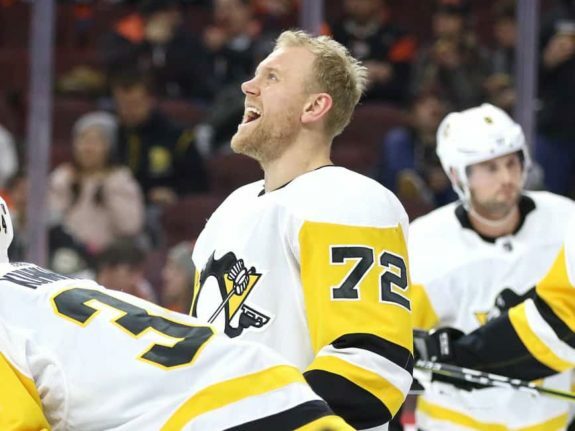 Hornqvist is willing to score the ugly goals, like the one that won the Penguins the Stanley Cup in 2017. And the Penguins haven’t been able to find a replacement for that when he’s gone. The downside of Hornqvist’s contract is the length. It’s rarely a good idea to invest long-term in a player in his mid-30s. But in this case, there are a few reasons this contract can work. One is that Hornqvist was going to be an unrestricted free agent at the end of this season, and if he hit the open market his price tag would have undoubtedly skyrocketed. Another is that the salary cap is going to be climbing next season, leaving the Penguins a little bit of wiggle room to sign other players. Maybe what is most important is that the Penguins have not found a replacement for what Hornqvist brings to their power play and their offense. Locking him down while they’re still a competitive team was unquestionably a better choice than letting him walk.